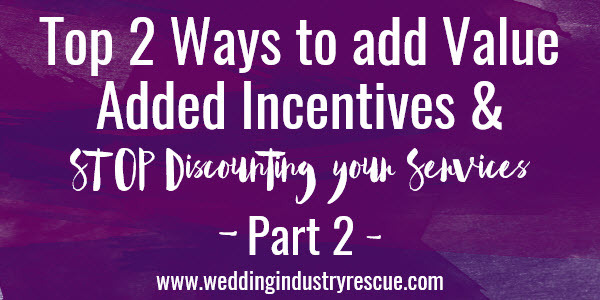 Top 2 ways to use Value Added incentives instead of discounting. 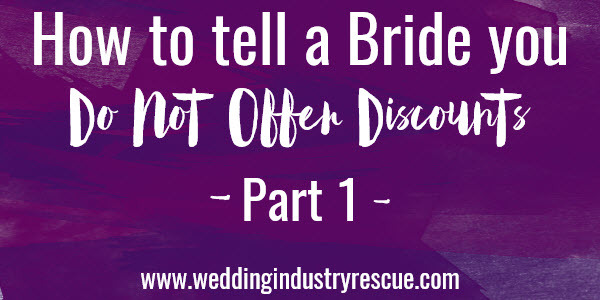 Hope you guys enjoy part two of our series on not discounting your services – if you missed part one of this series “How to tell a Bride you don’t offer Discounts – Part One” you can read it now. So, clearly we’re against discounting (as in, lowering your normal rates just to get a sale), but I didn’t say you couldn’t offer a value added incentive. Offering an incentive is a great way that you can “offer a discount” without devaluing your services. 1.) You could offer one of your other services at a reduced rate or at no charge when they book you. For example, as an event planner you may decide to offer your rehearsal dinner planning at no charge when the bride books your full service planning package within 7 days of meeting with you. A florist may decide to offer the brides bouquet for free when she spends over $2500 on her wedding flowers. The key to this type of value added style of offering an incentive is to give it some restrictions. Either that they have a set amount of time to book (within 7 days, for example) or they are required to book a certain dollar amount of services to get the incentive. Those aren’t the only two options, of course, but it’s your business so you’ll have to determine what works for you. 2.) But don’t feel restricted to your own services for value added incentives. Look to your favorite vendors! 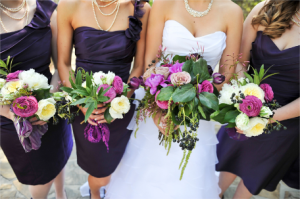 Using the planner example again, you could pair with your favorite florist and offer a free bouquet from them if the bride books your full service planning services. This is actually my favorite form of offering a value added incentive to get a bride to book on the spot. And I use it very liberally. Some people are shocked by how much I offer on these even. One of my offers right now is a $750 credit to one of my favorite florists when they book my full service planning services on any remaining 2013 dates. This works really well for a few reasons. One – it obviously helps me book any of our remaining dates that we may not otherwise book. Two – it insures that the couple will choose a vendor that I like working with and that I trust will make planning their wedding easier. Three – it builds the relationship that I have with the vendor. Now, just so you know, it didn’t cost me $750 to offer this. I worked out a deal with the florist to pay just half. So, to get a booking worth an average of $4500 – $6500 to me, it only costs me $375! I don’t know about you, but I’ll trade $375 for $5K all day long! This also provides a huge perk to my florist, who then ends up booking their entire wedding floral order, which is anywhere from $3K – $5K for one of our typical brides. Another perk of value added incentives is that you can often bump people up to the next level of service. Have you ever bought 2 pair of shoes because you got a good deal, but only if you bought the 2nd pair? It’s the same principle. You paid more overall for the total shoe purchase, and you probably weren’t even planning on buying 2 pairs of shoe that day. But you felt like you got a great deal and you probably wouldn’t have purchased both pairs without the incentive, right? So why not use this in your own business? What ways can you think of to use value added incentives in your business – and stop the discounting madness?? Let me know below or on our Wedding Industry Rescue Facebook page. 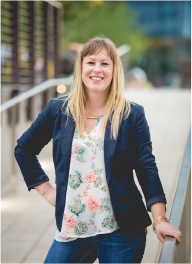 This Blog series was really informative and I keep rereading it to get ideas on what kind of incentives I could offer without it being a loss to me. How much is enough or how to make it appealing. Would love to read other comments or get feedback. I’ll keep checking back.